Tango de Mayo Hotel is located in the heart of the well-known Mayo Avenue, only 984 feet from 9 de Julio Avenue and 2625 feet from The Obelisk of Buenos Aires. Bright and spacious (deluxe room), helpful and friendly staff, roof top bar, central location. Located in Buenos Aires, within a 7-minute walk of The Obelisk of Buenos Aires and 700 yards of Palacio Barolo, Hotel UOM Buenos Aires has accommodations with a shared lounge and a bar, and free WiFi.... Clean, safe and very practical location. Located in the Retiro district in Buenos Aires, 0.6 mi from Colon Theater, Carles Hotel features a sun terrace and fitness center. Guests can enjoy the on-site bar. Rooms come with a flat-screen TV. The service at this hotel is exceptionally good. Very friendly and genuinely caring and attentive. Nothing is too much trouble for the staff. Just 1 block from upscale Santa Fe Avenue, Casa Calma Hotel offers chic décor and rooms with two-place spa baths. WiFi access is free. This small hotel has very comfortable, spacious, attractive rooms. Set in a renovated building, Duque Hotel offers rooms with designer décor in trendy Palermo Soho. A pool and spa facilities are available. Scalabrini Ortiz Metro Station is 2297 feet away. Very good staff, room and breakfast. Only 3 blocks from Serrano Square and the artisans fair, The Glu Boutique Hotel is set in Palermo Soho, nearby trendy cafes and pubs. It offers designer style décor. Wi-Fi is free. Great location. Good breakfast and a very friendly and helpful staff. Luxurious interiors, a fitness center and rooms with views of the garden or city are offered in the upscale Recoleta neighborhood in Buenos Aires. Colon Theater is a 5-minute drive. Very comfortable, classy, sassy, sophisticated and unique. You will not be disappointed. Conveniently located in the Palermo Hollywood district of Buenos Aires, Ilum Experience Home offers contemporary rooms, only a 15-minute walk from Plaza Serrano. The staff were just delightful and incredibly helpful. The charming Tanguero Hotel Boutique Antique's furnishings and décor invite guests to enter the world of tango in a welcoming environment in the center of Buenos Aires. Lovely spacious room and bathroom with clean and well kept installations. 474 Buenos Aires Hotel offers stylish accommodations and free Wi-Fi in the city’s bustling theater and shopping district. Colón Theater is 8 blocks away and Florida Street is 328 feet from the hotel. The best Hotel I've stayed so far. 4 stars that feel like 5. The staff was awesome. 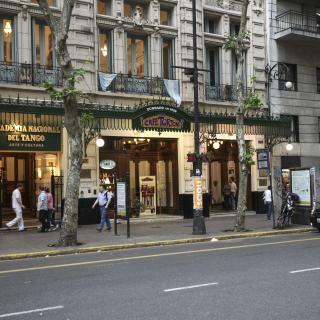 Boasting an a la carte restaurant, Hotel Facon Grande offers elegant and comfortable accommodations in the Buenos Aires City Center, 1312 feet from Florida Pedestrian Street. Amazing guys at the reception and great location! Breakfast also very good! Offering a swimming pool and a spa center, CH Madero Urbano Suites is set in the Puerto Madero district in Buenos Aires. the ban and fruit are nice. Thank you. 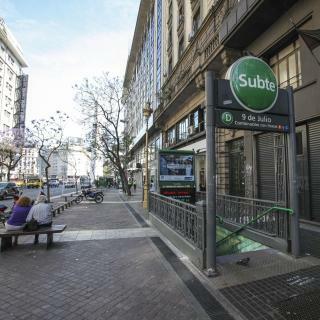 Located in the heart of Buenos Aires, Bulnes Eco Suites offers modern and luxurious studios with free high-speed WiFi access in trendy Palermo neighborhood. It was in a center location close to everything. The price was good not so expensive. The Legado Mitico is a stylish boutique hotel featuring spacious rooms with thematic décor inspired by the Argentinean culture and history. The place is chique and immaculate. 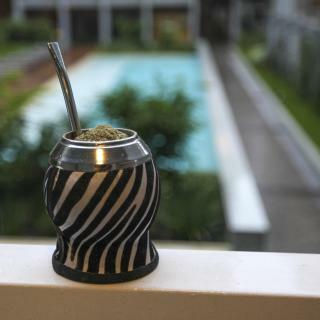 Located in Buenos Aires, a 20-minute walk from Tortoni Cafe, Küla Studios has barbecue facilities and a terrace. With a shared lounge, the 2-star hotel has air-conditioned rooms with free WiFi. The room was very new and clean. I guess we were one of the first guests. 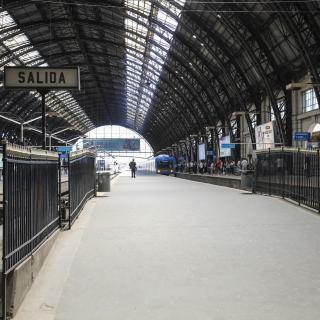 Located in Buenos Aires, Palermo Bridge is a 15-minute walk from Plaza Serrano Square. The property has a garden, as well as a shared lounge. Rooms contain a balcony with city views and free WiFi. The staff was very attentive and helpful. Many spoke english. Anselmo Buenos Aires, Curio Collection by Hilton offers comfortable accommodations in Buenos Aires. The property offers impeccable services and free WiFi access throughout the hotel. Rooms are quiet and clean. Good for sleeping in as dark and quiet at night. Comfortable. Which hotels in Buenos Aires offer an especially good breakfast? For hotels in Buenos Aires that serve highly-rated breakfasts, try Four Seasons Hotel Buenos Aires, Fierro Hotel Buenos Aires, and Mine Hotel. Many families visiting Buenos Aires loved staying at CasaCalma Hotel, Four Seasons Hotel Buenos Aires, and Magnolia Hotel Boutique. The average price per night for a 3-star hotel in Buenos Aires this weekend is $133 or, for a 4-star hotel, $221. Looking for something even fancier? 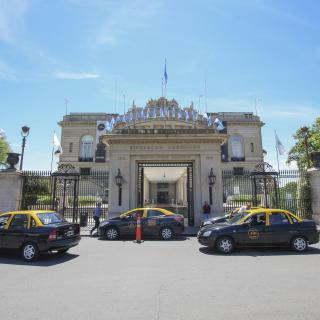 5-star hotels in Buenos Aires for this weekend cost around $620 per night, on average (based on Booking.com prices). Travelers who stayed in Buenos Aires near Ministro Pistarini International Airport (EZE) have said good things about Eze Inn Boutique Hotel, Hotel Plaza Central Canning, and Hotel Aeropuerto Ezeiza Casa de MR. Which neighborhood is the best one to stay at in Buenos Aires? 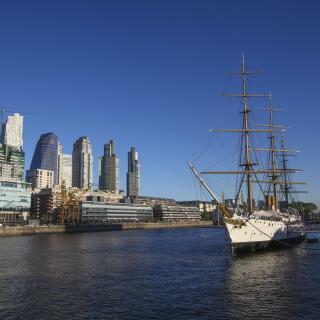 Palermo, Belgrano, and Puerto Madero are popular with other travelers visiting Buenos Aires. Which hotels are the best ones to stay at in Buenos Aires? Tango de Mayo Hotel, Four Seasons Hotel Buenos Aires, and Carles Hotel are some of the popular hotels in Buenos Aires. Which hotels in Buenos Aires are good for couples? These hotels in Buenos Aires are highly rated by couples: Four Seasons Hotel Buenos Aires, Fierro Hotel Buenos Aires, and Hotel UOM Buenos Aires. On average, it costs $59 per night to book a 3-star hotel in Buenos Aires for tonight. You'll pay around $123 if you choose to stay in a 4-star hotel tonight, while a 5-star hotel in Buenos Aires will cost around $312, on average (based on Booking.com prices). On average, 3-star hotels in Buenos Aires cost $52 per night, and 4-star hotels in Buenos Aires are $90 per night. If you're looking for something really special, a 5-star hotel in Buenos Aires can be found for $170 per night, on average (based on Booking.com prices). Which hotels in Buenos Aires have nice views? Alvear Icon Hotel - Leading Hotels of the World, Four Seasons Hotel Buenos Aires, and Carles Hotel got great room view-related reviews from travelers in Buenos Aires. Cosmopolitan and trendy with South American essence and European charm, Buenos Aires represents the living image of tango: elegant yet passionate and nostalgic. Surrounding its harbor and vastly populated by immigrants from the Old Continent, it is a faithful image of Argentina’s typical ethnic patchwork. 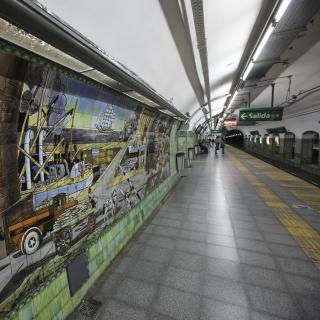 The enormous relief of Evita’s face at 9 de Julio Avenue, La Boca's humble and colorful streets, the stylish buildings along Avenida de Mayo, or the modernly refurbished docks in Puerto Madero: Buenos Aires is an exciting and captivating city, full of history and full of stories. Just outside the center in Recoleta, there are beautiful early 20th-century hotels, mansions and embassies surrounded by greenery. Palermo hotels include a vast array of apartments, hostels and small boutique accommodations. After arriving at Ezeiza International Airport, enjoy the rhythm of Buenos Aires and its many cultural offerings, fashionable shopping streets, its huge variety of restaurants, and the busy nightlife. I recommend the weekend market in San Telmo, the Cemtery, and the parks nearby including the giant flower. There is also a very good weekend market near the cemetery. Restaurants were good and reasonable....the wine was inexpensive and just amazingly great for the price. Take a taxi! Not expensive and easy to catch. 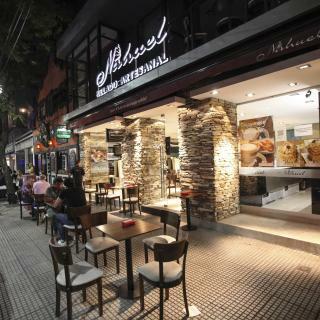 Buenos Aires is my native town, I always enjoy being there, the atmosphere and the food is magnificent. I love the walks through the city, shopping for leather goods and things in general. I recommend to eat at La Estancia, they have the best barbecue meat and all the different cuts are delicious, very affordable too. We will always come back there when we are in town. Buenos Aires is a fantastic city full of life and colour. Buenos Aires is a fantastic city full of life and colour. Not as dangerous as I expected, the people are very friendly. A little tricky if you’re an early riser but excellent if you’re a night owl. Buenos Aires is a wonderful city. Buenos Aires is a wonderful city. We enjoyed our stay tremendously. All of our tours were wonderful. We did the city tour including La Boca, a tango show, cruised the Tigre Delta, went to an estancia for wonderful asado and visited Iguazu. Loved everything.